Who Wants To Be A Millionaire slot is a new game from Big Time Gaming that offers some very big rewards and great gameplay that’s very similar to that of the real quiz show. Along with a couple of nice little features, this game offers you the chance to seat in the chair and play for up to 50 free spins with increasing multipliers too, meaning you could win up to 50,000x your bet. Of course, these are just the base symbols and there are other symbols in the game too. Firstly, you have the Wild symbol, shown as a question mark onto of a very hypnotic and colourful background. This will substitute for all other symbols in a winning combination apart from the Scatter symbol. 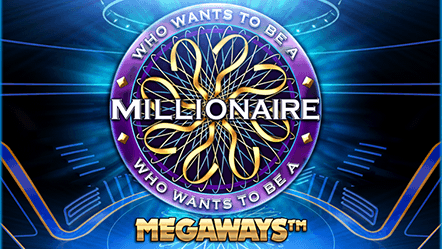 The Scatter symbol is shown as the Who Wants To Be A Millionaire’s Logo and is used to win free spins as well as trigger the Hot Seat Free Spins Gamble, but I’ll come onto that shortly. Extra Reel. You’ll notice that at the bottom of the screen there’s another reel which adds a symbol to it below reel 2, 3, 4 and 5. Reactions. This is a feature we’ve seen quite a few times, often known as an avalanche feature or something to that effect. It’s pretty simple but can be quite effective. Every symbol that forms a winning combination is part of what’s called a reaction and will be replaced at the end of the spin by new symbols falling down from above (hence the term avalanche is often used). If a symbol on the extra reel is also part of the win, a symbol from the right will come in and replace it. Free Spins Bonus. This is the most exciting bonus of the game triggered by 3 Scatter symbols and gives you a chance to play the real game. In short, you have 2 options. You can choose to walk away and collect the 8 free spins, or you can choose to gamble and play the Hot Seat Free Spins Gamble (I think that’s a no-brainer). Free Spins. The free spins actually work pretty well in this game. You start at a multiplier of just 1x, but for every reaction, you increase your multiplier by 1x and there’s no limit to this. Furthermore, you can win additional free spins by landing either 3 or 4 Scatter symbols on the extra reel, giving you 4 or 8 extra free spins, respectively. 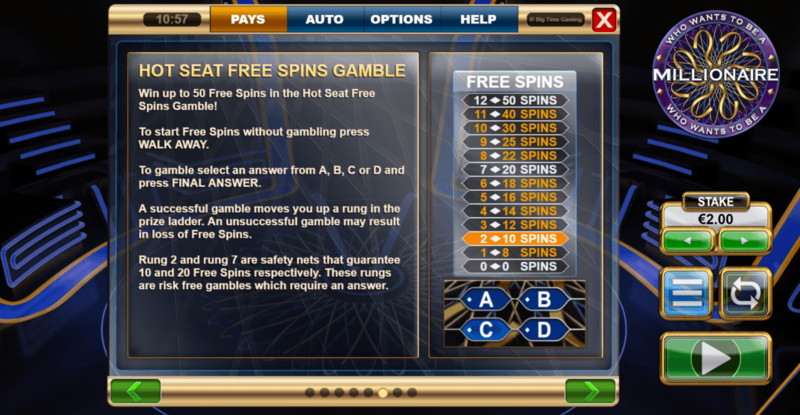 Hot Seat Free Spins Gamble. If you choose to gamble your 8 free spins, and frankly I don’t see why you wouldn’t, you can win up to 50 free spins which could also mean some very big multipliers. 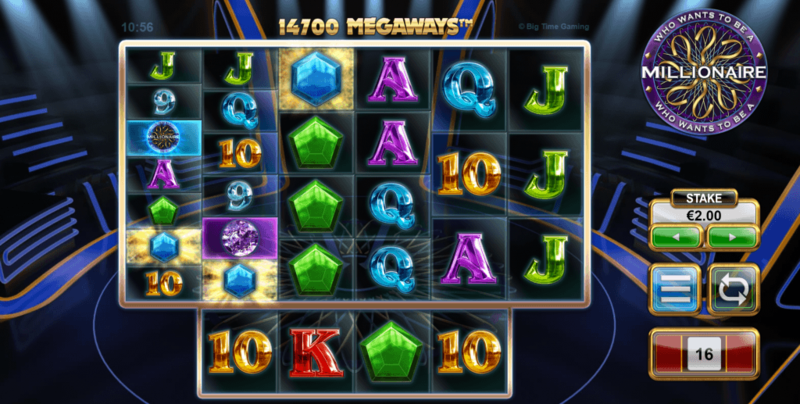 You must work your way up the ladder by answering questions successfully, gaining more free spins as you move up. Just like the real game, you have a couple of safety nets at rung and rung 7, meaning if you lose above these rungs you’ll still get the free spins indicated here (10 and 20 to be precise). To help you out, you have 3 lifelines. 50:50 will remove 2 incorrect answers for you, Phone a Friend will reveal the most likely answer and Ask the audience will give you odds on each answer. Work your way to the top and you could get a whopping 50 free spins and win up to 50,000x your bet. Who Wants To Be A Millionaire slot from Big Time Gaming is a truly entertaining game that I find quite hard to fault. I’m always looking for slots that are fun as well as rewarding and unfortunately there just aren’t that many out there. I’m pleased to say, however, that this game is very enjoyable and can also offer some very big payouts, but it’s certainly high variance so don’t expect wins to come all that often. Check it out now on Casumo and let us know what you think.